While working as a court linguist in San Jose, California recently, I heard a colleague complain, “I am constantly getting cold, but when I put on my jacket, I’m too warm.” Tis the season! And speaking of spring, I’m in the mood for florals! This is how I’m doing it right now with a velvet floral tank top. You might be able to tell in the photos that it has been very windy in the east Bay Area and Santa Cruz. It’s all due to that temperamental barometer. It’s windy the day before rains, the day after it rains, and sometimes just because it feels like it. And so, layering is inevitable. I even figure that this could be an acceptable work outfit. I can simply pop my black blazer on top. A pencil skirt and matching jacket tend to be a bit boring. But I figure I can break the monotony with this velvet floral print. I don’t even mind that some of the floral pattern will show below the hem of the jacket. Although I love floral patterns, I am particular about the way they are depicted. Some abstract flower designs seem almost ugly to me. But this one reminds me of a magical flower garden at night. And that makes it ideal for pairing with black. Then if it’s date night, I can simply take off the tank after work and fold it neatly into my tote bag. That is, because I happen to be wearing the tank over a long-sleeved crop top. And my silver cuff bracelet makes for an ideal accessory. I can’t wait until summer when I can simply wear the tank with a light skirt, maybe a white one, and some sandals. But for now, the pencil skirt makes for a nice slim silhouette especially with the fitted OTK boots. I hope you like this outfit with a floral top borrowed from my summer wardrobe. And I hope that you are enjoying the longer, brighter days of spring. Do you also love florals? Thanks, Paola. I love it too. 🙂 Kisses to you! 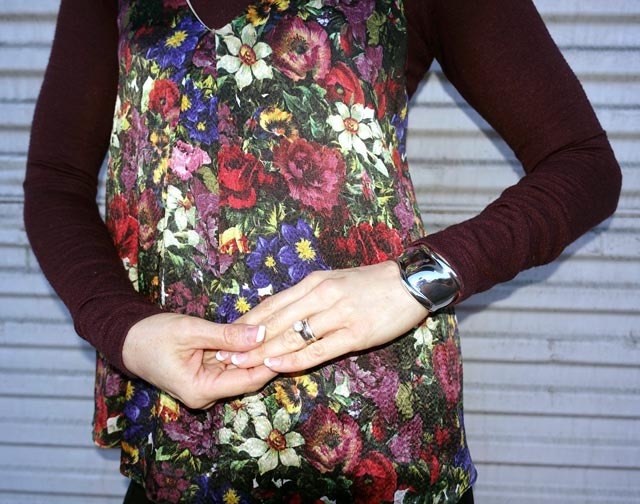 Loving the floral top, lady- so good for spring! Now if KC could just get some of that sunshine! 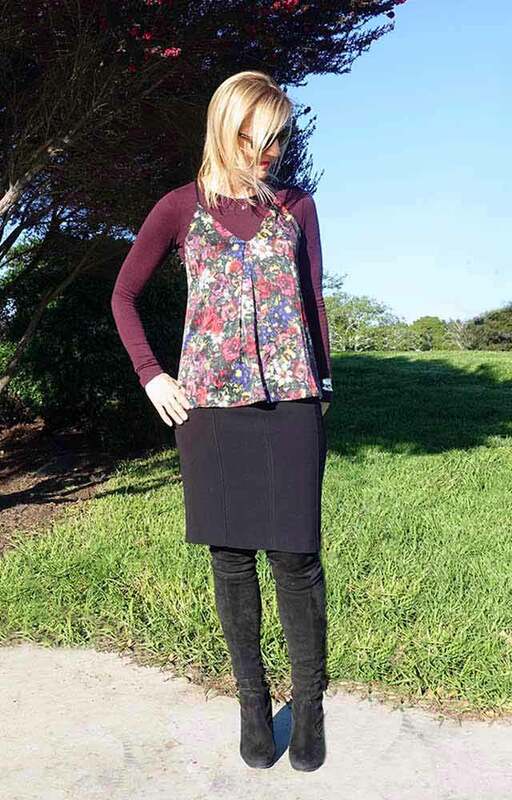 The print of this cami is really lovely and I really like your way of making it more season-appropriate; especially with the Stuart Weitzman boots! !